For the Tyne & Wear Metro station, see Monument Metro station. Bank and Monument are interlinked London Underground and Docklands Light Railway stations that form a public transport complex spanning the length of King William Street in the City of London. 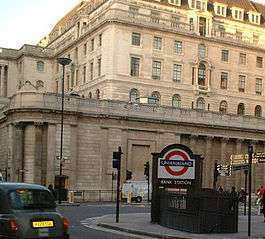 Bank station, named after the Bank of England, opened in 1900 at Bank junction and is served by the Central, Northern and Waterloo and City lines, and the Docklands Light Railway. Monument station, named after the Monument to the Great Fire of London, opened in 1884 and is served by the District and Circle lines. The stations have been linked as an interchange since 1933. The station complex is the one of the busiest on the London Underground network and is in fare zone 1. The Bank–Monument station complex was created by building links between several nearby stations constructed by different companies. The first station was opened by the Metropolitan Inner Circle Completion Railway. The Metropolitan Railway (MR) and District Railway (DR) had, by 1876, built most of the Inner Circle (now the Circle line), reaching Aldgate and Mansion House respectively. The companies were in dispute over the completion of the route as the DR was struggling financially and the MR was concerned that completion would affect its revenues through increased competition from the DR in the City area. City financiers keen to see the line completed, established the Metropolitan Inner Circle Completion Railway in 1874 to link Mansion House to Aldgate. Forced into action, the MR bought out the company and it and the DR began construction of the final section of the Inner Circle in 1879. The new section of railway included two new stations: Tower of London tube station and another located close to the Monument. The station at Monument opened with the name "Eastcheap" on 6 October 1884, after the nearby street, and was renamed "The Monument" on 1 November 1884. Initially, trains from both companies served the station on the Inner Circle service but other operational patterns have been used. 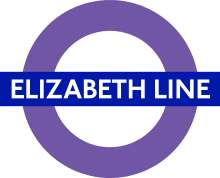 The Inner Circle service achieved a separate identity as the Circle line in 1949 although its trains were still provided by the District or Metropolitan lines. The Waterloo & City Railway was built by the London and South Western Railway (L&SWR) to link its terminus at Waterloo to the City. The station, with platforms under Queen Victoria Street and close to Mansion House, opened on 8 August 1898 as "City". The steeply sloping passages to the platforms were later supplemented with the "Travolator", one of the few sets of moving walkways on the whole underground system. Advertising at the Waterloo & City station often takes the form of large painted murals on the walls and ceilings of the sloped exits, forming one of the largest advertisements on the underground. The Waterloo and City line platforms were renamed "Bank" on 28 October 1940. The first station to be known as Bank opened on 25 February 1900 when the City & South London Railway (C&SLR, now part of the Northern line) opened its extension from Borough to Moorgate. 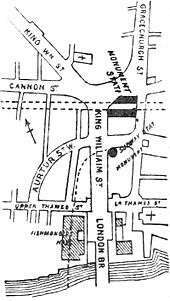 The earlier terminus of the line, King William Street, on a different tunnel alignment was closed at the same time. The C&SLR had obtained permission to demolish the 18th century church of St Mary Woolnoth on the corner of Lombard Street and build a station (originally proposed to be named "Lombard Street") on the site. After public protest, the company changed its plans to build only a sub-surface ticket hall and lift entrance in the crypt of the church. This necessitated moving the bodies elsewhere, strengthening the crypt with a steel framework and underpinning the church's foundations. Unusually for stations later converted to escalators, the original lift access from the ticket hall is still in use. Central line train on the westbound platform. The opening of the eastern terminus of the Central London Railway (CLR, now the Central line) at Bank followed on 30 July 1900. 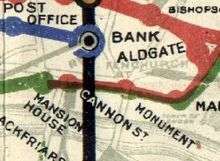 Bank and Monument shown on a 1908 Tube map. Bank was served by the Central London (blue) and City & South London (black) railways, while Monument was served by the Metropolitan (red) and District (green) railways. As with the C&SLR, the high cost of property in the City, coupled with the presence of the Royal Exchange, the Bank of England, and Mansion House, meant that the station had to be built entirely underground. Permission was granted by the City of London Corporation for the station to be sited beneath the busy junction of roads meeting at this point on condition that public subways were provided to act as pedestrian road crossings. To avoid undermining the road above, the station's lifts were installed in separate lift shafts rather than paired two-per-shaft as usual. To avoid wayleave payments to property owners and to lessen possible claims for damage during construction and operation, the CLR tunnels were directly under public streets. This caused the platforms under Threadneedle Street and Poultry to be so curved that one end of the platform cannot be seen from the other. East of Bank station the Central line tunnels have sharp curves to avoid the vaults of the Bank of England itself. Due to the close proximity of the CLR, W&CR and C&SLR stations, and the non-competing directions of their services, their ticket halls were soon connected, but connection between the CLR and C&SLR platforms were made only when escalators were installed in the 1920s. The southern end of the C&SLR (by then part of the Edgware-Highgate-Morden line) platforms was close to those of Monument station and, on 18 September 1933, a connecting escalator link was opened. Statue of James Henry Greathead which was erected by Bank station in 1994. The Docklands Light Railway built a tunnelled extension to platforms parallel to (but deeper than) the Northern line platforms which opened on 29 July 1991. The DLR platforms were connected at one end to the Central line and at the other to Monument station. A new link between the Waterloo & City and the Central line was excavated which uncovered part of one of the Greathead tunnelling shields used for the Waterloo and City line. This shield forms part of the new passageway, and passengers pass through when transferring between the two lines. A picture showing the 1-foot (30 cm) gap between the train and the platform edge (delineated by the solid white line). 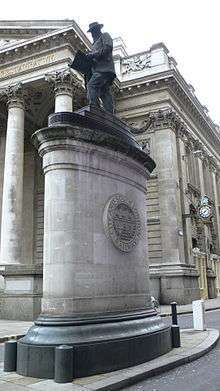 In January 1994 a statue of James Henry Greathead was erected outside the station, next to the Royal Exchange. It was unveiled by the Lord Mayor of London and is positioned on a plinth which hides a ventilation shaft for the Underground. On 11 January 1941, during the Blitz, 111 people were killed when a German bomb hit the booking hall, with the blast travelling down the stairs and escalators to the platforms. The crater, measuring 120 by 100 feet (37 m × 30 m), was covered with a Bailey Bridge for the traffic to pass over. The station itself was closed for two months. On 7 September 2003, Bank station was used for a disaster training exercise, Exercise Osiris, billed as "the most realistic live disaster exercise of its kind". The event, lasting several hours and involving about 500 police, fire brigade, ambulance and London Underground personnel, was intended to prepare the emergency services for mass decontamination in the event of a chemical, biological, radiological or nuclear attack. London Buses routes 8, 11;15, 21, 23, 25, 26, 40, 43, 76, 133, 141, 242 and 388 and heritage route 15H and night routes N8, N11, N21, N26, N76, N133, N199, N550 and N551. The original station had lifts directly to the platforms, but when escalators were later cut through the shafts, access for the mobility-impaired was lost. The only parts of the station that are fully accessible are the DLR platforms, which have lifts from the street (via the rectory of St Mary Woolnoth church). At peak times, Bank is also one of the most congested stations on the Underground, so Transport for London (TfL) is transforming it significantly, removing some bottlenecks, and improving access. The station's 15 escalators are being replaced or refurbished with a one-way system in operation in parts of the station. A new entrance on Walbrook, near Cannon Street station, will provide new escalators and lifts to the Waterloo and City line platforms. TfL is also consulting on retunnelling and widening the Northern line platforms, and adding lifts and new entrances on King William Street and Cannon Street. The work, agreed in 2015, will be carried out from 2016 to 2021 and will boost capacity by 40%, with 12 new escalators and 3 new lifts. It is also proposed to build a new tunnel to relocate the southbound Northern line platform. The northbound platform would then be extended back to give increased circulation space. 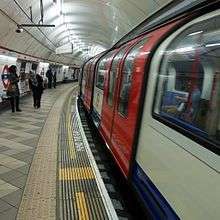 A similar exercise was carried out on the Northern line platforms at Angel and London Bridge stations. 1 2 3 4 "Multi-year station entry-and-exit figures" (XLS). London Underground station passenger usage data. Transport for London. April 2016. Retrieved 3 May 2016. 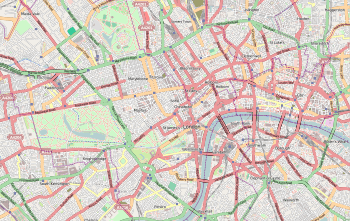 ↑ Transport for London (12 February 2013). "Freedom of Information DLR usage 1213". Transport for London. Retrieved 10 November 2013. 1 2 3 "Up-to-date DLR entry/exit statistics for each station" (XLSX). What Do They Know. Transport for London. 18 March 2016. Retrieved 2 April 2016. ↑ Historic England. "Bank of England (1079134)". National Heritage List for England. Retrieved 3 April 2015. ↑ Historic England. "Church Of St Mary Woolnoth (1064620)". National Heritage List for England. Retrieved 3 April 2015. 1 2 3 4 5 6 7 8 9 Rose, Douglas (1999). The London Underground, A Diagrammatic History. Douglas Rose/Capital Transport. ISBN 1-85414-219-4. ↑ "Tribute to Bank Tube station bomb victims of 1941". BBC. 11 January 2011. ↑ "London undergoes terror test". BBC News. September 2003. Retrieved 26 July 2013. ↑ "Improvements & projects: Bank and Monument". Transport for London. Retrieved 9 February 2015. ↑ "Bank Station Part 1: The Forgotten Upgrade". London Reconnections. ↑ "London Underground showcases proposals to boost Bank's capacity". Transport for London. May 2012. Retrieved 26 July 2013. ↑ "Green light for Bank station upgrade". ↑ Harvey, Dan C (September 2013). "More space at the bank". Modern Railways: 48.